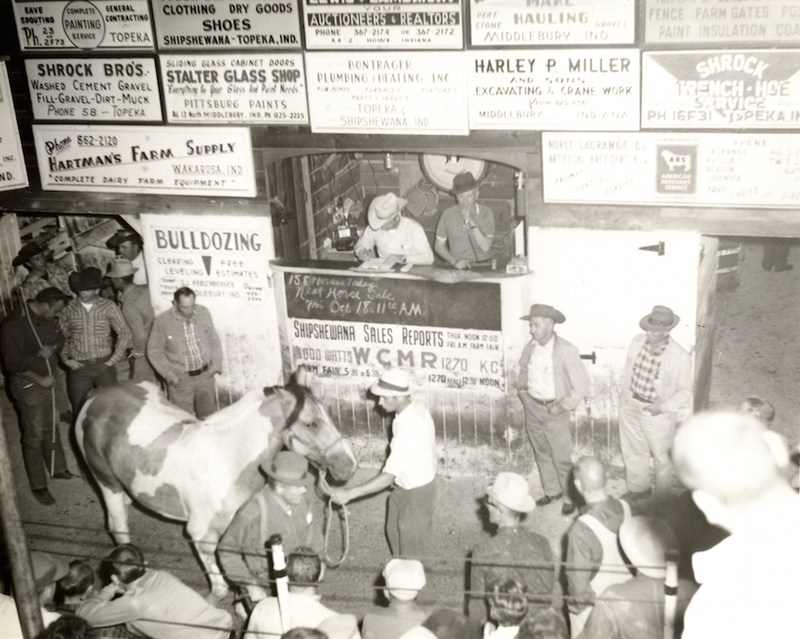 Shipshewana Trading Place, now one of the Midwest's most popular destinations, started in 1922 when six pigs, seven cows and several head of young cattle were sold at the home of George Curtis during the very first Shipshewana livestock auction. Business grew rapidly, so Curtis decided to build an auction barn at his home. In 1930, the first Auction Restaurant started in Curtis’s garage and was operated by the ladies of the Methodist Church until 1940, when Curtis asked Milo and Ruth Miller, who were then catering farm sales, if they would be interested in taking over the operation. Each day, the Millers backed Mr. Curtis’s automobile out of the garage, swept the floor and set up the restaurant equipment and gas stove. The vegetables came from Mrs. Miller’s garden, and the pie came from her oven at home. She even made homemade catsup to go on the 20 cent hamburgers. In 1947, Curtis sold the auction to Fred Lambright, who is the grandfather of Keith Lambright (current owner). He built a new sale barn at the present location and put in a large scale to sell fat hogs and cattle by the pound. In those days, people would bring items to sell out of their car trunks, unofficially starting the Shipshewana flea market. A roof was built for the flea market in 1947, though people continued to sell from their cars. In 1950, Lambright built a new Auction Restaurant, which could seat 50-60 people. Walter Schrock purchased the business from Lambright in 1961. 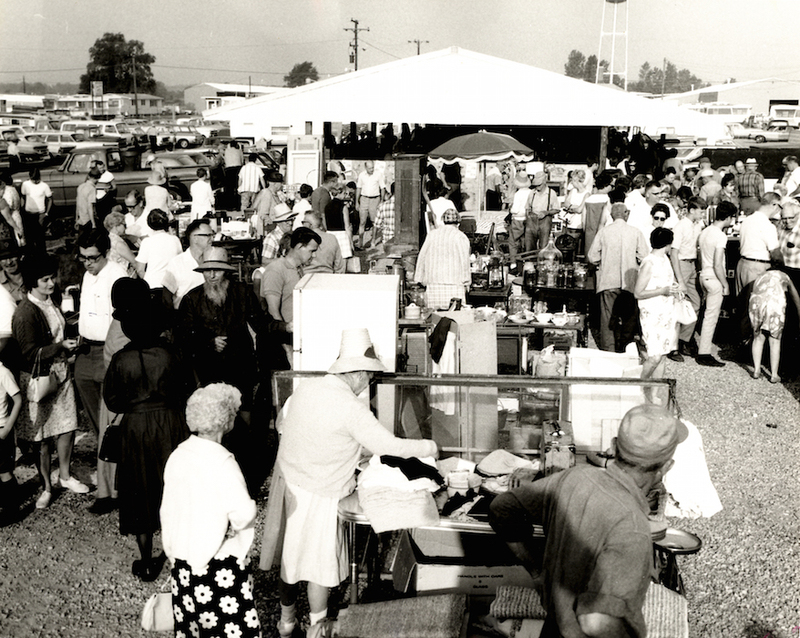 He expanded flea market grounds in 1968, which had grown from 100 to 400 vendors. The weekly antique auction had increased to ten auctioneers who were simultaneously selling, so in 1978, an antique auction building was put up. The Livestock Auction barn was destroyed by a fire in 1979. However, it was rebuilt in just 3 months, with the help of volunteers. Robert Lambright, along with his sons Keith and Kevin, purchased the business in 1981. The flea market was expanded to 1,000 vendor spaces, and a new restaurant and office building were built. The Farmstead Inn was built in 1997 to provide convenient and excellent lodging right across the street from the Auction and Flea Market. In 2014, a conference center was added to the Farmstead to accomodate retreats, conventions, banquets and meetings. The Shipshewana Antique Mall opened next door in 1998 and was a place for people to find quality antiques for 18 years. During it's operation, the Shipshewana Antique Markets began in the summer and still continue to be a popular event for antique lovers today. In 2017, the mall became the Farmstead Expo Barn, a place to host special events and auctions. The Expo Barn is accompanied by the Farmstead Event Pavilion, built in 2012, which provides a farmer's market-type venue for shows, reunions and weddings. For the RV-lover, the Shipshewana RV Park was added on the south side of the flea market grounds with 70 full hook-up sites and wi-fi in 2008. In 2016, a state-of-the-art Shipshewana RV Service Center was built next to the park to provide top recreational vehicle services to industries, dealers and RV-owners. Shipshewana Trading Place is proud of its rich heritage and community involvement since 1922. Now home of the Midwest's largest flea market, weekly antique, livestock and horse auctions, excellent lodging, delicious dining locations, gorgeous event facilities, craft & vintage shows, antique markets, and RV service, Shipshewana Trading Place is a must-stop when visiting Northern Indiana's Amish Country. As the business grows and evolves, visitors, buyers, and sellers can continue to expect top-notch efficient customer service along with a friendly smile.